Israel–United States relations refers to the bilateral relationship between the State of Israel and the United States of America. The relations are a very important factor in the United States government's overall policy in the Middle East, and Congress has placed considerable importance on the maintenance of a close and supportive relationship. Since 1985, the United States has provided nearly US$3 billion in grants annually to Israel, with Israel being the largest annual recipient of American aid from 1976 to 2004 and the largest cumulative recipient of aid ($121 billion, not inflation-adjusted) since World War II. Seventy-four percent of these funds must be spent purchasing US goods and services. More recently, in fiscal year 2014, the US provided $3.1 billion in foreign military aid to Israel. Israel also benefits from about $8 billion of loan guarantees. Almost all US aid to Israel is now in the form of military assistance, while in the past it also received significant economic assistance. Strong congressional support for Israel has resulted in Israel receiving benefits not available to other countries. In addition to financial and military aid, the United States also provides political support to Israel, having used its United Nations Security Council veto power 42 times with respect to resolutions relating to Israel, out of a total 83 times in which its veto has ever been used. Between 1991 and 2011, 15 vetos were used to protect Israel out of 24 in total. Bilateral relations have evolved from an initial US policy of sympathy and support for the creation of a Jewish homeland in 1948 to an unusual partnership that links a small but militarily powerful Israel, dependent on the United States for its economic and military strength, with the American superpower trying to balance other competing interests in the region, including Russia's intentions. Others maintain that Israel is a strategic ally, and that US relations with Israel strengthen the US presence in the Middle East. Israel is one of the United States' two original major non-NATO allies in the Middle East. Late Republican Senator Jesse Helms used to call Israel "America's aircraft carrier in the Middle East", when explaining why the United States viewed Israel as such a strategic ally, saying that the military foothold in the region offered by the Jewish State alone justified the military aid that the United States grants Israel every year. Currently, there are seven major non-NATO allies in the Greater Middle East. Support for Zionism among American Jews was minimal, until the involvement of Louis Brandeis in the Federation of American Zionists, starting in 1912 and the establishment of the Provisional Executive Committee for General Zionist Affairs in 1914; it was empowered by the Zionist Organization "to deal with all Zionist matters, until better times come". While Woodrow Wilson was sympathetic to the plight of Jews in Europe, he repeatedly stated in 1919 that US policy was to "acquiesce" to the Balfour Declaration but not officially support Zionism. [need quotation to verify] However, the US Congress passed the Lodge-Fish resolution, the first joint resolution stating its support for "the establishment in Palestine of a national home for the Jewish people" on 21 September 1922. The same day, the Mandate of Palestine was approved by the Council of the League of Nations. During World War II, while US foreign policy decisions were often ad hoc moves and solutions dictated by the demands of the war, the Zionist movement made a fundamental departure from traditional Zionist policy and its stated goals, at the Biltmore Conference in May 1942. Previous stated policy towards establishing a Jewish "national home" in Palestine were gone; these were replaced with its new policy "that Palestine be established as a Jewish Commonwealth" like other nations, in cooperation with America, not Britain. Two attempts by Congress in 1944 to pass resolutions declaring US government support for the establishment of a Jewish state in Palestine were objected to by the Departments of War and State, because of wartime considerations and Arab opposition to the creation of a Jewish state. The resolutions were permanently dropped. Following the war, the "new postwar era witnessed an intensive involvement of the United States in the political and economic affairs of the Middle East, in contrast to the hands-off attitude characteristic of the prewar period. Under Truman the United States had to face and define its policy in all three sectors that provided the root causes of American interests in the region: the Soviet threat, the birth of Israel, and petroleum." Previous American presidents, although encouraged by active support from members of the American and world Jewish communities, as well as domestic civic groups, labor unions, and political parties, supported the Jewish homeland concept, alluded to in Britain's 1917 Balfour Declaration, they officially continued to "acquiesce". Throughout the Roosevelt and Truman administrations, the Departments of War and State recognized the possibility of a Soviet-Arab connection and the potential Arab restriction on oil supplies to the US and advised against US intervention on behalf of the Jews. With continuing conflict in the area and worsening humanitarian conditions among Holocaust survivors in Europe, on 29 November 1947, and with US support, the United Nations General Assembly adopted as Resolution 181, the United Nations Partition Plan for Palestine, which recommended the adoption and implementation of a Plan of Partition with Economic Union. The voting was heavily lobbied by Zionist supporters, which Truman himself later noted, and rejected by the Arabs. As the end of the mandate approached, the decision to recognize the Jewish state remained contentious, with significant disagreement between President Truman, his domestic and campaign adviser, Clark Clifford, and both the State Department and Defense Department. Truman, while sympathetic to the Zionist cause, was most concerned about relieving the plight of the displaced persons; Secretary of State George Marshall feared US backing of a Jewish state would harm relations with the Muslim world, limit access to Middle Eastern oil, and destabilize the region. 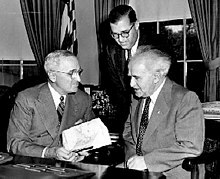 On 12 May 1948, Truman met in the Oval Office with Secretary of State Marshall, Under Secretary of State Robert A. Lovett, Counsel to the President Clark Clifford, and several others to discuss the Palestine situation. Clifford argued in favor of recognizing the new Jewish state in accordance with the partition resolution. Marshall opposed Clifford's arguments, contending that they were based on domestic political considerations in the election year. Marshall said that, if Truman followed Clifford's advice and recognized the Jewish state, then he would vote against Truman in the election. Truman did not clearly state his views in the meeting. Two days later, on 14 May 1948, the United States, under Truman, became the first country to extend any form of recognition. This happened within hours of the Jewish People's Council gathering at the Tel Aviv Museum and David Ben-Gurion declaring "the establishment of a Jewish state in Eretz Israel, to be known as the State of Israel". The phrase "in Eretz-Israel" is the only place in the Declaration of the Establishment of the State of Israel containing any reference to the location of the new State. MY DEAR MR. PRESIDENT: I have the honor to notify you that the state of Israel has been proclaimed as an independent republic within frontiers approved by the General Assembly of the United Nations in its Resolution of 29 November 1947, and that a provisional government has been charged to assume the rights and duties of government for preserving law and order within the boundaries of Israel, for defending the state against external aggression, and for discharging the obligations of Israel to the other nations of the world in accordance with international law. The Act of Independence will become effective at one minute after six o'clock on the evening of 14 May 1948, Washington time. With this unexpected decision, US representative to the United Nations Warren Austin, whose team had been working on an alternative trusteeship proposal, shortly thereafter left his office at the UN and went home. Secretary of State Marshall sent a State Department official to the United Nations to prevent the entire United States delegation from resigning. De jure recognition came on 31 January 1949. Following UN mediation by American Ralph Bunche, the 1949 Armistice Agreements ended the 1948 Arab Israeli War. Related to enforcement of the armistice, the United States signed the Tripartite Declaration of 1950 with Britain and France. In it, they pledged to take action within and outside the United Nations to prevent violations of the frontiers or armistice lines; outlined their commitment to peace and stability in the area and their opposition to the use or threat of force; and reiterated their opposition to the development of an arms race in the region. Under rapidly changing geopolitical circumstances, US policy in the Middle East was generally geared toward supporting Arab states' independence; aiding the development of oil-producing countries; preventing Soviet influence from gaining a foothold in Greece, Turkey, and Iran; and preventing an arms race and maintaining a neutral stance in the Arab–Israeli conflict. US policymakers initially used foreign aid to support these objectives. During these years of austerity, the United States provided Israel moderate amounts of economic aid, mostly as loans for basic foodstuffs; a far greater share of state income derived from German war reparations, which were used for domestic development. France became Israel's main arms supplier at this time and provided Israel with advanced military equipment and technology. This support was seen by Israel to counter the perceived threat from Egypt under President Gamal Abdel Nasser with respect to the "Czech arms deal" of September 1955. During the 1956 Suez Crisis, the Israeli Defense Forces invaded Egypt and were soon followed by French and British forces. For differing reasons, France, Israel and Britain colluded to topple Nasser by regaining control of the Suez Canal, following its nationalization, and to occupy parts of western Sinai assuring free passage of shipping in the Gulf of Aqaba. In response, the US, with support from Soviet Union at the UN intervened on behalf of Egypt to force a withdrawal. Afterward, Nasser expressed a desire to establish closer relations with the United States. Eager to increase its influence in the region, and prevent Nasser from going over to the Soviet Bloc, US policy was to remain neutral and not become too closely allied with Israel. At this time, the only assistance the US provided Israel was food aid. In the early 1960s, the US would begin to sell advanced, but defensive, weapons to Israel, Egypt, and Jordan, including Hawk anti-aircraft missiles. During Lyndon B. Johnson's presidency, US policy shifted to a whole-hearted, but not unquestioning, support for Israel. In 1966, when defecting Iraqi pilot Munir Redfa landed in Israel flying a Soviet-built MiG-21 fighter jet, information on the plane was immediately shared with the United States. In the lead up to the Six-Day War of 1967, while the Johnson Administration was sympathetic to Israel's need to defend itself against foreign attack, the US worried that Israel's response would be disproportionate and potentially destabilizing. Israel's raid into Jordan after the Samu Incident was very troubling to the US because Jordan was also an ally and had received over $500 million in aid for construction of the East Ghor Main Canal, which was virtually destroyed in subsequent raids. The primary concern of the Johnson Administration was that should war break out in the region, the United States and Soviet Union would be drawn into it. Intense diplomatic negotiations with the nations in the region and the Soviets, including the first use of the Hotline, failed to prevent war. When Israel launched preemptive strikes against the Egyptian Air force, Secretary of State Dean Rusk was disappointed as he felt a diplomatic solution could have been possible. Prior to the Six-War Day, US administrations had taken considerable care to avoid giving the appearance of favoritism. Writing in American Presidents and the Middle East, George Lenczowski notes, "Johnson's was an unhappy, virtually tragic presidency", regarding "America's standing and posture in the Middle East", and marked a turning point in both US–Israeli and US–Arab relations. He characterizes the Middle Eastern perception of the US as moving from "the most popular of Western countries" before 1948, to having "its glamour diminished, but Eisenhower's standing during the Arab–Israeli Suez Crisis convinced many Middle Eastern moderates that, if not actually lovable, the United States was at least a fair country to deal with; this view of US fairness and impartiality still prevailed during Kennedy's presidency; but during Lyndon B. Johnson's presidency America's policy took a definite turn in the pro-Israeli direction". He added: "The June war of 1967 confirmed this impression, and from 1967 on [writing in 1990] the United States emerged as the most distrusted if not actually hated country in the Middle East. Following the war, the perception in Washington was that many Arab states (notably Egypt) had permanently drifted toward the Soviets. In 1968, with strong support from Congress, Johnson approved the sale of Phantom fighters to Israel, establishing the precedent for US support for Israel's qualitative military edge over its neighbors. However, the US continued to provide military equipment to Arab states such as Lebanon and Saudi Arabia, to counter Soviet arms sales in the region. During the Israeli–Egyptian War of Attrition, Israeli commandos captured a Soviet-built P-12 radar station in an operation code-named Rooster 53. Previously unknown information was subsequently shared with the US. When the French government imposed an arms embargo on Israel in 1967, Israeli spies procured designs of the Dassault Mirage 5 from a Swiss Jewish engineer in order to build the IAI Kfir. These designs were also shared with the United States. Qualitative Military Edge (QME) is a concept in US foreign policy. The U.S. commits itself to maintain Israel's qualitative military edge (QME) -- that is, the technological, tactical, and other advantages that allow it to deter numerically superior adversaries. This policy is defined in current US law. On 19 June 1970, Secretary of State William P. Rogers formally proposed the Rogers Plan, which called for a 90-day cease-fire and a military standstill zone on each side of the Suez Canal, to calm the ongoing War of Attrition. It was an effort to reach agreement specifically on the framework of UN Resolution 242, which called for Israeli withdrawal from territories occupied in 1967 and mutual recognition of each state's sovereignty and independence. The Egyptians accepted the Rogers Plan, but the Israelis were split and did not; they failed to get sufficient support within the "unity government". Despite the Labor-dominant Alignments, formal acceptance of UN 242 and "peace for withdrawal" earlier that year, Menachem Begin and the right wing Gahal alliance were adamantly opposed to withdraw from the Palestinian Territories; the second-largest party in the government resigned on 5 August 1970. Ultimately, the plan also failed due to insufficient support from Nixon for his Secretary of State's plan, preferring instead the position of his National Security Advisor, Henry Kissinger, not to pursue the initiative. No breakthrough occurred even after President Sadat of Egypt in 1972 unexpectedly expelled Soviet advisers from Egypt, and again signaled to Washington his willingness to negotiate. On 28 February 1973, during a visit in Washington, D.C., the then Israeli prime minister Golda Meir agreed with the then U.S. National Security Advisor Henry Kissinger's peace proposal based on "security versus sovereignty": Israel would accept Egyptian sovereignty over all Sinai, while Egypt would accept Israeli presence in some of Sinai strategic positions. Faced with this lack of progress on the diplomatic front, and hoping to force the Nixon administration to become more involved, Egypt prepared for military conflict. 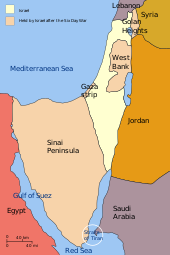 In October 1973, Egypt and Syria, with additional Arab support, attacked Israeli forces occupying their territory since the 1967 war, thus starting the Yom Kippur War. Despite intelligence indicating an attack from Egypt and Syria, Prime Minister Golda Meir made the controversial decision not to launch a pre-emptive strike. Meir, among other concerns, feared alienating the United States, if Israel was seen as starting another war, as Israel only trusted the United States to come to its aid. In retrospect, the decision not to strike was probably a sound one. Later, according to Secretary of State Henry Kissinger, had Israel struck first, they would not have received "so much as a nail". On 6 October 1973, during the Jewish holiday of Yom Kippur, Egypt and Syria, with the support of Arab expeditionary forces and with backing from the Soviet Union, launched simultaneous attacks against Israel. The resulting conflict is known as the Yom Kippur War. The Egyptian Army was initially able to breach Israeli defenses, advance into the Sinai, and establish defensive positions along the east bank of the Suez Canal, but they were later repulsed in a massive tank battle when they tried to advance further to draw pressure away from Syria. The Israelis then crossed the Suez Canal. Major battles with heavy losses for both sides took place. At the same time, the Syrians almost broke through Israel's thin defenses in the Golan Heights, but were eventually stopped by reinforcements and pushed back, followed by a successful Israeli advance into Syria. Israel also gained the upper hand in the air and at sea early in the war. Days into the war, it has been suggested that Meir authorized the assembly of Israeli nuclear bombs. This was done openly, perhaps in order to draw American attention, but Meir authorized their use against Egyptian and Syrian targets only if Arab forces managed to advance too far. The Soviets began to resupply Arab forces, predominantly Syria. Meir asked Nixon for help with military supply. After Israel went on full nuclear alert and loaded their warheads into waiting planes, Nixon ordered the full scale commencement of a strategic airlift operation to deliver weapons and supplies to Israel; this last move is sometimes called "the airlift that saved Israel". However, by the time the supplies arrived, Israel was gaining the upper hand. Again, the US and Soviets feared that they would be drawn into a Middle East conflict. After the Soviets threatened intervention on the behalf of Egypt, following Israeli advances beyond the cease-fire lines, the US increased the Defense Condition (DEFCON) from four to three, the highest peacetime level. This was prompted after Israel trapped Egypt's Third Army east of the Suez canal. Kissinger realized the situation presented the United States with a tremendous opportunity—Egypt was totally dependent on the US to prevent Israel from destroying the army, which now had no access to food or water. The position could be parlayed later into allowing the United States to mediate the dispute, and push Egypt out of Soviet influences. As a result, the United States exerted tremendous pressure on the Israelis to refrain from destroying the trapped army. In a phone call with Israeli ambassador Simcha Dinitz, Kissinger told the ambassador that the destruction of the Egyptian Third Army "is an option that does not exist". The Egyptians later withdrew their request for support and the Soviets complied. After the war, Kissinger pressured the Israelis to withdraw from Arab lands; this contributed to the first phases of a lasting Israeli-Egyptian peace. American support of Israel during the war contributed to the 1973 OPEC embargo against the United States, which was lifted in March 1974. In early 1975, the Israeli government turned down a US initiative for further redeployment in Sinai. President Ford responded on 21 March 1975 by sending Prime Minister Rabin a letter stating that Israeli intransigence has complicated US worldwide interests, and therefore the administration will reassess its relations with the Israeli government. In addition, arms shipments to Israel halted. The reassessment crisis came to an end with the Israeli–Egyptian disengagement of forces agreement of 4 September 1975. The Carter administration was characterized by very active US involvement in the Middle East peace process. With the May 1977 election of Likud's Menachem Begin as prime minister, after 30 years of leading the Israeli government opposition, major changes took place regarding Israeli withdrawal from the occupied territories. This led to friction in US–Israeli bilateral relations. The two frameworks included in the Carter-initiated Camp David process were viewed by right-wing elements in Israel as creating US pressures on Israel to withdraw from the captured Palestinian territories, as well as forcing it to take risks for the sake of peace with Egypt. The Israeli-Egyptian peace treaty was signed at the White House on March 26, 1979. It led to Israeli withdrawal from Sinai by 1982. Likud governments have since argued that their acceptance of full withdrawal from the Sinai as part of these accords and the eventual Egypt–Israel Peace Treaty fulfilled the Israeli pledge to withdraw from occupied territory. President Carter's support for a Palestinian homeland and for Palestinian political rights particularly created tensions with the Likud government, and little progress was achieved on that front. Israeli supporters expressed concerns early in the first Ronald Reagan term about potential difficulties in US–Israeli relations, in part because several Presidential appointees had ties or past business associations with key Arab countries (for example, Secretaries Caspar Weinberger and George P. Shultz were officers in the Bechtel Corporation, which has strong links to the Arab world; see Arab lobby in the United States.) However, President Reagan's personal support for Israel, and the compatibility between Israeli and Reagan perspectives on terrorism, security cooperation, and the Soviet threat, led to considerable strengthening in bilateral relations. In 1981, Weinberger and Israeli Minister of Defense Ariel Sharon signed the Strategic Cooperation Agreement, establishing a framework for continued consultation and cooperation to enhance the national security of both countries. In November 1983, the two sides formed a Joint Political Military Group, which meets twice a year, to implement most provisions of that agreement. Joint air and sea military exercises began in June 1984, and the United States constructed two War Reserve Stock facilities in Israel to stockpile military equipment. Although intended for American forces in the Middle East, the equipment can be transferred to Israeli use if necessary. US–Israeli ties strengthened during the second Reagan term. Israel was granted "major non-NATO ally" status in 1989, giving it access to expanded weapons systems and opportunities to bid on US defense contracts. The United States maintained grant aid to Israel at $3 billion annually and implemented a free trade agreement in 1985. Since then all customs duties between the two trading partners have been eliminated. However, relations soured when Israel carried out Operation Opera, an Israeli airstrike on the Osirak nuclear reactor in Baghdad. Reagan suspended a shipment of military aircraft to Israel, and harshly criticized the action. Relations also soured during the 1982 Lebanon War, when the United States even contemplated sanctions to stop the Israeli Siege of Beirut. The US reminded Israel that weaponry provided by the US was to be used for defensive purposes only, and suspended shipments of cluster munitions to Israel. Although the war exposed some serious differences between Israeli and US policies, such as Israel's rejection of the Reagan peace plan of 1 September 1982, it did not alter the Administration's favoritism for Israel and the emphasis it placed on Israel's importance to the United States. Although critical of Israeli actions, the United States vetoed a Soviet-proposed United Nations Security Council resolution to impose an arms embargo on Israel. Secretary of State James Baker told an American Israel Public Affairs Committee (AIPAC, a pro-Israel lobby group) audience on 22 May 1989, that Israel should abandon its "expansionist policies". President Bush raised the ire of the Likud government when he told a press conference on 3 March 1991, that East Jerusalem was occupied territory and not a sovereign part of Israel as Israel says. Israel had annexed East Jerusalem in 1980, an action which did not gain international recognition. The United States and Israel disagreed over the Israeli interpretation of the Israeli plan to hold elections for a Palestinian peace conference delegation in the summer of 1989, and also disagreed over the need for an investigation of the Jerusalem incident of 8 October 1990, in which Israeli police killed 17 Palestinians. Amid the Iraq-Kuwait crisis and Iraqi threats against Israel generated by it, former President Bush repeated the US commitment to Israel's security. Israeli–US tension eased after the start of the Persian Gulf war on 16 January 1991, when Israel became a target of Iraqi Scud missiles. The United States urged Israel not to retaliate against Iraq for the attacks because it was believed that Iraq wanted to draw Israel into the conflict and force other coalition members, Egypt and Syria in particular, to quit the coalition and join Iraq in a war against Israel. Israel did not retaliate, and gained praise for its restraint. Following the Gulf War, the administration immediately returned to Arab-Israeli peacemaking, believing there was a window of opportunity to use the political capital generated by the US victory to revitalize the Arab-Israeli peace process. On 6 March 1991, President Bush addressed Congress in a speech often cited as the administration's principal policy statement on the new order in relation to the Middle East, following the expulsion of Iraqi forces from Kuwait. Michael Oren summarizes the speech, saying: "The president proceeded to outline his plan for maintaining a permanent U.S. naval presence in the Gulf, for providing funds for Middle East development, and for instituting safeguards against the spread of unconventional weapons. The centerpiece of his program, however, was the achievement of an Arab–Israeli treaty based on the territory-for-peace principle and the fulfillment of Palestinian rights." As a first step, Bush announced his intention to reconvene the international peace conference in Madrid. However, unlike earlier American peace efforts, no new aid commitments would be used. This was both because President Bush and Secretary Baker felt the coalition victory and increased US prestige would itself induce a new Arab–Israeli dialogue, and because their diplomatic initiative focused on process and procedure rather than on agreements and concessions. From Washington's perspective, economic inducements would not be necessary, but these did enter the process because Israel injected them in May. Israeli Prime Minister Yitzhak Shamir's request for $10 billion in US loan guarantees added a new dimension to US diplomacy and sparked a political showdown between his government and the Bush administration. Bush and Baker were thus instrumental in convening the Madrid peace conference in October 1991 and in persuading all the parties to engage in the subsequent peace negotiations. It was reported widely that the Bush Administration did not share an amicable relationship with the Likud government of Yitzhak Shamir. However, the Israeli government did win the repeal of United Nations General Assembly Resolution 3379, which equated Zionism with racism. After the conference, in December 1991, the UN passed United Nations General Assembly Resolution 46/86; Israel had made revocation of resolution 3379 a condition of its participation in the Madrid peace conference. After the Labor party won the 1992 election, US–Israel relations appeared to improve. The Labor coalition approved a partial housing construction freeze in the occupied territories on 19 July, something the Shamir government had not done despite Bush Administration appeals for a freeze as a condition for the loan guarantees. Israel and the PLO exchanged letters of mutual recognition on 10 September, and signed the Declaration of Principles on 13 September 1993. 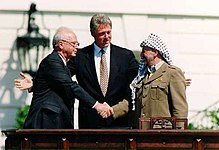 President Bill Clinton announced on 10 September that the United States and the PLO would reestablish their dialogue. On 26 October 1994, President Clinton witnessed the Jordan–Israeli peace treaty signing, and President Clinton, Egyptian President Mubarak, and King Hussein of Jordan witnessed the White House signing of the 28 September 1995, Interim Agreement between Israel and the Palestinians. President Clinton attended the funeral of assassinated Prime Minister Yitzhak Rabin in Jerusalem in November 1995. Following a March 1996 visit to Israel, President Clinton offered $100 million in aid for Israel's anti-terror activities, another $200 million for Arrow anti-missile deployment, and about $50 million for an anti-missile laser weapon. President Clinton disagreed with Prime Minister Benjamin Netanyahu's policy of expanding Jewish settlements in the occupied territories, and it was reported that the President believed that the Prime Minister delayed the peace process. President Clinton hosted negotiations at the Wye River Conference Center in Maryland, ending with the signing of an agreement on 23 October 1998. Israel suspended implementation of the Wye agreement in early December 1998, when the Palestinians violated the Wye Agreement by threatening to declare a state (Palestinian statehood was not mentioned in Wye). In January 1999, the Wye Agreement was delayed until the Israeli elections in May. Ehud Barak was elected Prime Minister on 17 May 1999, and won a vote of confidence for his government on 6 July 1999. President Clinton and Prime Minister Barak appeared to establish close personal relations during four days of meetings between 15 and 20 July. President Clinton mediated meetings between Prime Minister Barak and Chairman Arafat at the White House, Oslo, Shepherdstown, Camp David, and Sharm al-Shaykh in the search for peace. Mahmoud Abbas, George W. Bush, and Ariel Sharon after reading statement to the press during the closing moments of the Red Sea Summit in Aqaba, Jordan, June 4, 2003. President George W. Bush and Prime Minister Ariel Sharon established good relations in their March and June 2001 meetings. On 4 October 2001, shortly after the September 11 attacks, Sharon accused the Bush Administration of appeasing the Palestinians at Israel's expense in a bid for Arab support for the US anti-terror campaign. The White House said that the remark was unacceptable. Rather than apologize for the remark, Sharon said that the United States failed to understand him. Also, the United States criticized the Israeli practice of assassinating Palestinians believed to be engaged in terrorism, which appeared to some Israelis to be inconsistent with the US policy of pursuing Osama bin Laden "dead or alive". In 2003, on the heels of the Second Intifada and a sharp economic downturn in Israel, the US provided Israel with $9 billion in conditional loan guarantees made available through 2011 and negotiated each year at the US–Israel Joint Economic Development Group. All recent US administrations have disapproved of Israel's settlement activity as prejudging final status and possibly preventing the emergence of a contiguous Palestinian state. However, President Bush noted in an April 14, 2002 Memorandum which came to be called "the Bush Roadmap" (and which established the parameters for subsequent Israel-Palestinian negotiations) the need to take into account changed "realities on the ground, including already existing major Israeli population centers", as well as Israel's security concerns, asserting that "It is unrealistic to expect that the outcome of final status negotiations will be full and complete return to the armistice lines of 1949." He later emphasized that, within these parameters, details of the borders were subjects for negotiations between the parties. At times of violence, US officials have urged Israel to withdraw as rapidly as possible from Palestinian areas retaken in security operations. The Bush Administration insisted that United Nations Security Council resolutions be "balanced" by criticizing Palestinian as well as Israeli violence, and it vetoed resolutions which did not meet that standard. Secretary of State Condoleezza Rice did not name a Special Middle East Envoy and did not say that she would not get involved in direct Israeli-Palestinian negotiations of issues. She said that she preferred to have the Israelis and Palestinians work together, although she traveled to the region several times in 2005. The Administration supported Israel's disengagement from Gaza as a way to return to the Road Map process to achieve a solution based on two states, Israel and Palestine, living side by side in peace and security. The evacuation of settlers from the Gaza Strip and four small settlements in the northern West Bank was completed on 23 August 2005. On 14 July 2006, the US Congress was notified of a potential sale of $210 million worth of jet fuel to Israel. The Defense Security Cooperation Agency noted that the sale of the JP-8 fuel, should it be completed, will "enable Israel to maintain the operational capability of its aircraft inventory", and that "The jet fuel will be consumed while the aircraft is in use to keep peace and security in the region". It was reported on 24 July that the United States was in the process of providing Israel with "bunker buster" bombs, which would allegedly be used to target the leader of Lebanon's Hezbollah guerilla group and destroy its trenches. American media also questioned whether Israel violated an agreement not to use cluster bombs on civilian targets. Although many of the cluster bombs used were advanced M-85 munitions developed by Israel Military Industries, Israel also used older munitions purchased from the US. Evidence during the conflict had shown that cluster bombs had hit civilian areas, although the civilian population had mostly fled, as well as Israel claiming that Hezbollah frequently used civilian areas to stockpile weaponry and fire rockets, in violation of international law. Many bomblets remained undetonated after the war, causing hazard for Lebanese civilians. Israel said that it had not violated any international law because cluster bombs are not illegal and were used only on military targets. On 15 July, the United Nations Security Council again rejected pleas from Lebanon that it call for an immediate ceasefire between Israel and Lebanon. The Israeli newspaper Haaretz reported that the US was the only member of out the 15-nation UN body to oppose any council action at all. On 19 July, the Bush administration rejected calls for an immediate ceasefire. Secretary of State Condoleezza Rice said that certain conditions had to be met, not specifying what they were. John Bolton, then US Ambassador to the United Nations, rejected the call for a ceasefire, on the grounds that such an action addressed the conflict only superficially: "The notion that you just declare a ceasefire and act as if that is going to solve the problem, I think is simplistic." On 26 July, foreign ministers from the US, Europe, and the Middle East that met in Rome vowed "to work immediately to reach with the utmost urgency a ceasefire that puts an end to the current violence and hostilities". However, the US maintained strong support for the Israeli campaign, and the conference's results were reported to have fallen short of Arab and European leaders' expectations. In September 2008, The Guardian reported that the U.S. vetoed Israeli Prime Minister Ehud Olmert's plan to bomb Iranian nuclear facilities the previous May. Israeli–US relations came under increased strain during Prime Minister Netanyahu's second administration and the new Obama administration. After he took office, President Barack Obama made achieving a peace deal between Israel and the Palestinians a major goal, and pressured Prime Minister Netanyahu into accepting a Palestinian state and entering negotiations. Netanyahu eventually conceded on 14 July 2009. In accordance with US wishes, Israel imposed a ten-month freeze on settlement construction in the West Bank. As the freeze did not include East Jerusalem, which Israel regards as its sovereign territory, or 3,000 pre-approved housing units already under construction, as well as the failure to dismantle already-built Israeli outposts, the Palestinians rejected the freeze as inadequate, and refused to enter negotiations for nine months. In 2009, Obama became the first US President to authorize the sale of bunker buster bombs to Israel. The transfer was kept secret to avoid the impression that the United States was arming Israel for an attack on Iran. In February 2011, the Obama administration vetoed a UN resolution declaring Israeli settlements in the West Bank illegal. In March 2010, Israel announced that it would continue to build 1,600 new homes that were already under construction in the eastern Jerusalem neighborhood of Ramat Shlomo, during Vice President Joe Biden's visit to Israel. The incident was described as "one of the most serious rows between the two allies in recent decades". Secretary of State Hillary Clinton said that Israel's move was "deeply negative" for US–Israeli relations. East Jerusalem is widely considered by the international community to be occupied territory, while Israel disputes this, as it annexed the area. Obama was reported to be "livid" over the announcement. Shortly afterward, President Obama instructed Secretary of State Hillary Clinton to present Netanyahu with a four-part ultimatum: that Israel cancel the approval of the housing units, freeze all Jewish construction in East Jerusalem, make a gesture to the Palestinians that it wants peace with a recommendation on releasing hundreds of Palestinian prisoners, and agree to discuss a partition of Jerusalem and a solution to the Palestinian refugee problem during the negotiations. Obama threatened that neither he nor any senior administration official would meet Netanyahu and his senior ministers during their upcoming visit to Washington. On 26 March 2010, Netanyahu and Obama met in the White House. The meeting was conducted without photographers or any press statements. During the meeting, Obama demanded that Israel extend the settlement freeze after its expiration, impose a freeze on Jewish construction in East Jerusalem, and withdraw troops to positions held before the start of the Second Intifada. Netanyahu did not give written concessions on these issues, and presented Obama with a flowchart on how permission for building is granted in the Jerusalem Municipality to reiterate that he had no prior knowledge of the plans. Obama then suggested that Netanyahu and his staff stay at the White House to consider his proposals so that he could inform Obama right away if he changed his mind, and was quoted as saying: "I'm still around, let me know if there is anything new". Netanyahu and his aides went to the Roosevelt Room, spent a further half-hour with Obama, and extended his stay for a day of emergency talks to restart peace negotiations, but left without any official statement from either side. In July 2010, a 2001 video of citizen Netanyahu surfaced; he was speaking to a group of bereaved families in Ofra, Israel about relations with the United States and the peace process, and reportedly unaware he was being recorded. He said: "I know what America is; America is a thing you can move very easily, move it in the right direction. They won't get in their way." He also bragged how he undercut the peace process when he was prime minister during the Clinton administration. "They asked me before the election if I'd honor [the Oslo accords]," he said. "I said I would, but ... I'm going to interpret the accords in such a way that would allow me to put an end to this galloping forward to the '67 borders. While it created little stir in the press, it was heavily criticized among the Left in Israel. Obama called for a return to the pre-1967 Israeli borders with mutually agreed land swaps. It was my reference to the 1967 lines—with mutually agreed swaps—that received the lion's share of the attention, including just now. And since my position has been misrepresented several times, let me reaffirm what "1967 lines with mutually agreed swaps" means. By definition, it means that the parties themselves—Israelis and Palestinians—will negotiate a border that is different than the one that existed on June 4, 1967. That's what mutually agreed-upon swaps means. It is a well-known formula to all who have worked on this issue for a generation. It allows the parties themselves to account for the changes that have taken place over the last 44 years. It allows the parties themselves to take account of those changes, including the new demographic realities on the ground, and the needs of both sides. The ultimate goal is two states for two people: Israel as a Jewish state and the homeland for the Jewish people and the state of Palestine as the homeland for the Palestinian people—each state in joined self-determination, mutual recognition and peace. Now the precise delineation of those borders must be negotiated. We'll be generous about the size of the future Palestinian state. But as President Obama said, the border will be different than the one that existed on 4 June 1967. Israel will not return to the indefensible boundaries of 1967. On 20 September 2011, President Obama declared that the US would veto any Palestinian application for statehood at the United Nations, asserting that "there can be no shortcut to peace". In October 2011, the new American Defense Secretary, Leon Panetta, suggested that Israeli policies were partly responsible for its increasing diplomatic isolation in the Middle East. The Israeli government responded that the problem was the growing radicalism in the region, rather than their own policies. In 2012, President Obama signed into law a bill that would extend by another three years the program of United States guarantees for Israeli government debt. Tony Blinken, National Security Advisor to US Vice President Joe Biden, lamented in 2012 a tendency by US politicians to use the debate over policy toward Israel for political purposes. Until then, Israel had been a bastion of bipartisan consensus in the US. In 2010 and again in July–August 2012, Israeli exports to the United States surpassed those to the European Union, usually the top destination for Israeli exports. Reaction in Israel was mixed to the Geneva interim agreement on the Iranian nuclear program. Prime Minister Netanyahu strongly criticized it as a "historic mistake", and finance minister Naftali Bennett called it a "very bad deal". However, Kadima Party leader Shaul Mofaz, opposition leader Isaac Herzog, and former Aman chief Amos Yadlin voiced some measure of support for the agreement and suggested that it was more important to maintain good ties to Washington than to publicly rebuke the agreement. On 2 April 2014, US ambassador to the UN Samantha Power reaffirmed the administration's stand that the US opposes all unilateral Palestinian moves to statehood. In December 2014 Congress passed the United States–Israel Strategic Partnership Act of 2013. This new category is one notch above the Major Non-NATO Ally classification and adds additional support for defense, energy, and strengthen cooperation business and academics. The bill additionally calls for the US to increase their war reserve stock in Israel $1.8 billion. Bar Ilan's Begin-Sadat Center for Strategic Studies conducted a study in November 2014 which showed that 96% of the Israeli public feels that the country's relations with the United States are important or very important. It was also felt that Washington is a loyal ally and that America will come to Israel's aid against existential threats. On the other hand, only 37% believe that President Obama has a positive attitude towards Israel (with 24% saying that his attitude is neutral). On 23 December 2016, the United Nations Security Council passed a resolution calling for an end to Israeli settlements; the Obama administration's UN ambassador, Samantha Power, was instructed to abstain—although the U.S. had previously vetoed a comparable resolution in 2011. President-elect Donald Trump attempted to intercede by publicly advocating the resolution be vetoed and successfully persuading Egypt's Abdel Fattah el-Sisi to temporarily withdraw it from consideration. The resolution was then "proposed again by Malaysia, New Zealand, Senegal and Venezuela"—and passed 14 to 0. Netanyahu's office alleged that "the Obama administration not only failed to protect Israel against this gang-up at the UN, it colluded with it behind the scenes," adding: "Israel looks forward to working with President-elect Trump and with all our friends in Congress, Republicans and Democrats alike, to negate the harmful effects of this absurd resolution." On 28 December 2016, US Secretary of State John Kerry strongly criticized Israel and its settlement policies in a speech. Israeli Prime Minister Benjamin Netanyahu strongly criticized the UN Resolution and Kerry's speech. On 6 January 2017, the Israeli government withdrew its annual dues from the organization, which totaled $6 million in United States dollars. On 5 January 2017, the United States House of Representatives voted 342–80 to condemn the UN Resolution. According to Army Radio, the US has reportedly pledged to sell Israel materials used to produce electricity, nuclear technology, and other supplies. Donald Trump and Benjamin Netanyahu. February 15, 2017 in the White House. Trump was inaugurated as US President on 20 January 2017; he appointed a new ambassador to Israel, David M. Friedman. On 22 January 2017, in response to Trump's inauguration, the Israeli prime minister Benjamin Netanyahu announced his intention to lift all restrictions on construction in the West Bank. In September 2017 it was announced that the US would open their first permanent military base in Israel. On 6 December 2017, President Trump recognized Jerusalem as the capital of Israel. The US Embassy was opened in Jerusalem (while keeping the offices in Tel-Aviv) on May 14, 2018, the 70th anniversary of the Independence of Israel. On 25 March 2019, President Trump signed the United States recognition of the Golan Heights as part of Israel, in a joint press conference in Washington with Israeli Prime Minister Benjamin Netanyahu, making the US the first country other than Israel to recognize Israeli sovereignty over the Golan Heights. Table from an April 11, 2013 Congressional Research Service report titled "U.S. Foreign Aid to Israel". Since the 1970s, Israel has been one of the top recipients of United States foreign aid. In the past, a portion was dedicated to economic assistance, but all economic aid to Israel ended in 2007 due to Israel's growing economy. Currently, Israel receives $3 billion annually in US assistance through Foreign Military Financing (FMF). Seventy-four percent of these funds must be spent on the acquisition of US defense equipment, services, and training. Thus, "United States military aid to Israel is seen by many as a subsidy for U.S. industries", according to Kenneth M. Pollack. FMF is intended to promote US national security by contributing to global stability, strengthening military support for democratically elected governments and containing transnational threats, including terrorism and trafficking of weapons. According to the United States Department of State, these grants enable US allies to improve their defense capabilities and foster closer military relationships between the US and recipient nations. Meanwhile, Republican Kentucky Senator Rand Paul has stated, in regards to US foreign military financing to Israel, that "aid hampers Israel's ability to make its own decisions as it sees fit". In 1998, Israeli, congressional, and Administration officials agreed to reduce US $1.2 billion in Economic Support Funds (ESF) to zero over ten years, while increasing FMF from $1.8 billion to $2.4 billion. Separate from the scheduled cuts, there was an extra $200 million in anti-terror assistance, $1.2 billion to implement the Wye agreement, and the supplemental appropriations bill assisted for another $1 billion in FMF for the 2003 fiscal year. For the 2005 fiscal year, Israel received $2.202 billion in FMF, $357 million in ESF, and migration settlement assistance of $50 million. For 2006, the Administration has requested $240 million in ESF and $2.28 billion in FMF. H.R. 3057, passed in the House on 28 June 2005, and in the Senate on 20 July, approved these amounts. House and Senate measures also supported $40 million for the settlement of immigrants from the former Soviet Union and plan to bring the remaining Ethiopian Jews to Israel. President Obama's Fiscal Year 2010 budget proposes $53.8 billion for appropriated international affairs' programs. From that budget, $5.7 billion is appropriated for foreign military financing, military education, and peacekeeping operations. From that $5.7 billion, $2.8 billion, almost 50% is appropriated for Israel. Israel also has available roughly $3 billion of conditional loan guarantees, with additional funds coming available if Israel meets conditions negotiated at the U.S.-Israel Joint Economic Development Group. But Eli Lake, the national security correspondent of The Washington Times, reported on 23 September 2011, that Obama had authorized at the beginning of his presidency "significant new aid to the Israeli military that includes the sale of 55 deep-penetrating bombs known as bunker busters". Former head of the Israeli Air Force, retired Major General Eitan Ben Eliyahu, has called the American sale of Lockheed Martin F-35 Lightning II nuclear capable stealth fighter bombers to Israel a key test of the relationship. While United States law forbids the use of offset agreements on FMF sales, Israel's Industrial Cooperation Authority attempts to secure industrial participation contracts of around 35 percent of such sales. In fiscal year 2013, the automatic U.S. budget sequestration process took effect as required by the Budget Control Act of 2011. The process cut appropriations for certain discretionary spending, which reduced foreign military aid to Israel by $157 million, and also reduced funding for Israeli and U.S.-Israeli missile defense programs by $32.7 million. In November 2013, Steven Strauss (a faculty member at the Harvard Kennedy School) published an editorial calling for the United States to phase out all grant aid to Israel. Prof. Strauss argues that the United States should retain a close relationship with Israel, but that Israel is affluent enough to pay for the military equipment it needs. The United States views the growth of Israeli settlements in the West Bank as an impediment to the success of peace negotiations, acknowledging that most world powers view the settlements as illegal. Israel, on the other hand, views the land as a security bulwark and religious Jewish Israelis hold the land is a God-given inheritance. Israel says that it plans to retain blocs of settlements in any peace treaty. In January 2015, Jewish settlers at the "Adei Ad illegal outpost"  threw stones at diplomats from a US delegation who had arrived to inspect vandalism reported at a grove of Palestinian-owned trees in the occupied West Bank. It was reported that recently settlers were suspected of uprooting thousands of olive tree saplings, some of which had been planted in honor of senior Palestinian official Ziad Abu Ein, who collapsed and died after an altercation with an Israeli soldier. The American consulate came to inspect the grove because some of the land owners claim US citizenship. No injuries were reported. A US State Department spokesman, Jeff Rathke, said: "We can confirm a vehicle from the Consulate General was pelted with stones and confronted by a group of armed settlers today in the West Bank, near the Palestinian village of Turmus Ayya." He added that the US is "deeply concerned" about the attack and that the Israeli authorities recognize "the seriousness of the incident". A police spokeswoman said the police were investigating the incident and no arrests had been made. The US State Department has offered the Israeli authorities a videotape of the incident showing no American drew weapons. Yossi Dagan, Head of the Shomron Regional Council, urged Interior Minister Gilad Erdan to expel the American delegation, stating that they were spies. The incident is expected to chill the relationship between the United States and Israel, which is already strained, although this is the first known physical attack against American diplomatic staff. Syria has repeatedly requested that Israel re-commence peace negotiations with the Syrian government. There is an ongoing internal debate within the Israeli government regarding the seriousness of this Syrian invitation for negotiations. Some Israeli officials asserted that there had been some unpublicized talks with Syria not officially sanctioned by the Israeli government. The United States demanded that Israel desist from even exploratory contacts with Syria to test whether Damascus is serious in its declared intentions to hold peace talks with Israel. US Secretary of State Condoleezza Rice was forceful in expressing Washington's view on the matter to Israeli officials that even exploratory negotiations with Syria must not be attempted. For years, Israel obeyed Washington's demand to desist from officially returning to peace talks. However, around May 2008, Israel informed the US that it was starting peace talks with Syria brokered by Turkey. Syria withdrew from the peace talks several months later in response to the Gaza War. The United States has taken on the preeminent role in facilitating peace negotiations between Israel and the Palestinian Authority. The US has been criticized as acting as the attorney of the Israeli government rather than as an honest broker, catering and coordinating with the Israeli government at the expense of advancing the peace talks. For example, under the US–Israeli "no surprises" policy, the US government must first check with the Israeli government any ideas for advancing the negotiations before publicly proposing them, which allegedly may have stripped the US of the "independence and flexibility required for serious peacemaking". Over the years, the United States and Israel have regularly discussed Israel's sale of sensitive security equipment and technology to various countries, especially the People's Republic of China. US administrations believe that such sales are potentially harmful to the security of US forces in Asia. China has looked to Israel to obtain technology it could not acquire from elsewhere, and has purchased a wide array of military equipment and technology, including communications satellites, and Harpy Killer unmanned aerial vehicles in 1999, and which China tested over the Taiwan Strait in 2004. In 2000, the United States persuaded Israel to cancel the sale of the Phalcon. The US was also said to have demanded that Israel provide information on 60 recent arms deals with China, agree to US supervision of arms deals which could be seen as "sensitive" to the US. On 21 October 2005, it was reported that pressure from Washington forced Israel to freeze a major contract with Venezuela to upgrade its 22 US-manufactured F-16 fighter jets. The Israeli government had requested US permission to proceed with the deal, but permission was not granted. After capturing East Jerusalem in the 1967 Six-Day War, Israel annexed it and incorporated it into the Jerusalem Municipality, and has built neighborhoods and homes in Arab neighborhoods there, along with government offices. Israel has insisted that Jerusalem is its eternal and indivisible capital. The United States does not agree with this position and believes the permanent status of Jerusalem is still subject to negotiations. This is based on the UN's 1947 Partition plan for Palestine, which called for separate international administration of Jerusalem. This position was accepted at the time by most other countries and the Zionist leadership, but rejected by the Arab countries. Most countries had located their embassies in Tel Aviv before 1967; Jerusalem was also located on the contested border. The Declaration of Principles and subsequent Oslo Accords signed between Israel and the Palestine Liberation Organization in September 1993 similarly state that it is a subject for permanent status negotiations. US administrations have consistently indicated, by keeping the Embassy of the United States in Israel in Tel Aviv, that Jerusalem's status is unresolved. In 1995, however, both houses of Congress overwhelmingly passed the Jerusalem Embassy Act to move the embassy to Jerusalem, no later than 31 May 1999, and suggested funding penalties on the State Department for non-compliance. Executive branch opposition to such a move, on constitutional questions of Congressional interference in foreign policy, as well as a series of presidential waivers, based on national security interests, have delayed the move by all successive administrations, since it was passed during the Clinton Administration. The US Consulate General in Jerusalem was first established in 1844, just inside the Jaffa Gate. A permanent consular office was established in 1856 in this same building. The mission moved to Street of the Prophets in the late 19th century, and to its present location on Agron Street in 1912. The Consulate General on Nablus Road in East Jerusalem was built in 1868 by the Vester family, the owners of the American Colony Hotel. In 2006, the US Consulate General on Agron Road leased an adjacent building, a Lazarist monastery built in the 1860s, to provide more office space. In March 2010, General David Petraeus was quoted by Max Boot saying the lack of progress in the Middle East peace process has "fomented anti-Americanism, undermined moderate Arab regimes, limited the strength and depth of U.S. partnerships, increased the influence of Iran, projected an image of U.S. weakness, and served as a potent recruiting tool for Al Qaeda". When questioned by journalist Philip Klein, Petraeus said Boot "picked apart" and "spun" his speech. He believes there are many important factors standing in the way of peace, including "a whole bunch of extremist organizations, some of which by the way deny Israel's right to exist". He continued: "There's a country that has a nuclear program who denies that the Holocaust took place. So again we have all these factors in there. This [Israel] is just one." US-Israeli relations came under strain in March 2010, as Israel announced it was building 1,600 new homes in the eastern Jerusalem neighborhood of Ramat Shlomo as Vice President Joe Biden was visiting. Secretary of State Hillary Clinton described the move as "insulting". Israel apologized for the timing of the announcement. On 6 December 2017 U.S. President Donald Trump officially recognized Jerusalem as Israel's capital and announced his intention to move the American embassy to Jerusalem. On 22 January 2018 Vice President Mike Pence in an address to the Israeli Knesset announced that the embassy would be moved before the end of 2019. On 18 October 2018, Secretary of State Mike Pompeo announced that the US Consulate-General in Jerusalem would be merged into the US Embassy in Jerusalem. Hitherto, the Consulate General had been responsible for conducting US relations with the Palestinians. In early March 2019, the Consulate General was formally merged into the US Embassy, ending the US practice of assigning separate missions to the Israelis and Palestinians. The Consulate General's former Agron Street site will be repurposed as the Embassy's new Palestinian Affairs Unit. As of July 2006, a poll stated that 44% of Americans thought that the "United States supports Israel about the right amount", 11% thought "too little", and 38% thought "too much". The same poll asked "In general, do you favor or oppose the establishment of a Palestinian state that is recognized by the United Nations?" with 42% responding in the affirmative with 34% opposed. Many in the United States question the levels of aid and general commitment to Israel, and argue that a US bias operates at the expense of improved relations with various Arab states. Others maintain that democratic Israel is a helpful and strategic ally, and believe that US relations with Israel strengthen the US presence in the Middle East. A 2002–2006 Gallup Poll of Americans by party affiliation (Republican/Democratic) and ideology (conservative/moderate/liberal) found that, although sympathy for Israel is strongest amongst the right (conservative Republicans), the group most on the left (liberal Democrats) also have a greater percentage sympathizing with Israel. Although proportions are different, each group has most sympathizing more with Israel, followed by both/neither, and lastly more with the Palestinians. These findings support the view that support for Israel in the US is bipartisan. A 2007 Gallup World Affairs poll included the annual update on Americans' ratings of various countries around the world, and asked Americans to rate the overall importance to the United States of what happens in most of these nations, according to that poll, Israel was the only country that a majority of Americans felt both favorably toward (63%) and said that what happens there is vitally important to the United States (55%). A 2013 Gallup poll finds 64% of Americans sympathize with Israelis and 12% with Palestinians. Analysis of the poll data showed that Republicans, conservatives and older Americans were more likely to be partial to Israel. Republicans (78%) were much more likely to sympathize with Israel than Democrats (55%). Democratic support for Israel has increased by four percent since 2001, while Republican support for the Jewish state has jumped 18 percentage points in the same period. The percentage of respondents favoring the Palestinians increases with formal education, ranging from 8% of those with no college experience to 20% of postgraduates. According to Gallup, Palestinians receive the highest sympathy from Democrats, liberals, and postgraduates, but even among these, support tops off at 24%. According to a 2013 BBC World Service Poll, the United States is the only Western country surveyed holding favorable views of Israel, and the only country in the survey with a majority of positive ratings, with 51% of Americans viewing Israel's influence positively and 32% expressing a negative view. Israeli attitudes toward the US are largely positive. In several ways of measuring a country's view of America (American ideas about democracy; ways of doing business; music, movies, and television; science and technology; and spread of US ideas), Israel came on top as the developed country who viewed it most positively. A 2012 report from The David Project, an Israel advocacy organization in the US, found that the strongest anti-Israel behaviour in America is found in universities. Quoting the experience of Jewish students who felt largely comfortable in American universities, the report denied that anti-Israeli feelings were based on antisemitism, as commonly believed. Instead the problem was said to lie in a "drip-drip negativity" about Israel that threatened to erode support over the long term, and might eventually spread from campuses to the population at large. Amongst ethnic groups, the Hispanic and Latino population is believed to be the most hostile towards Israel, according to the Israel Project (TIP), a US nonprofit organization active in Israel advocacy. According to TIP, Israel is more popular among older Americans, Republicans, conservatives and Evangelicals and less popular among "liberal elites", African Americans and Democrats. In 2012 tensions emerged between the Emergency Committee for Israel and other Jewish charities it argued are hostile to Israel. According to Paul Berger, The group's advertisements against Jewish charities it accuses of supporting anti-Israel organizations seemed unsuccessful. Several people quoted in the Emergency Committee for Israel's New York Times advertisement immediately distanced themselves from the publicity campaign. The Jewish groups the ads targeted reported little change in donor support. In December 2014, a public opinion poll of Israelis showed a majority of Israelis believe Israel's relationship with the US is "in crisis". The survey found that 61.7 percent of respondents said there was a crisis in US-Israel relations. Less than one quarter of respondents said the relations were "stable and good." A majority of people polled said that Netanyahu's government had "harmed" the relationship. Despite the positive attitudes towards the US, the poll found that Israelis are generally mistrustful of the US president, with only 37 percent of respondents calling Obama's views of Israel "positive," while 61% characterized his attitude towards Israel as "negative" or "neutral." A 2015 Bloomberg Politics poll of Americans asked "When it comes to relations between the U.S. and Israel, which of the following do you agree with more?" 47% of respondents chose "Israel is an ally but we should pursue America's interests when we disagree with them." 45% of respondents chose "Israel is an important ally, the only democracy in the region, and we should support it even if our interests diverge." 8% were unsure. Israel is in large part a nation of Jewish immigrants. Israel has welcomed newcomers inspired by Zionism, the Jewish national movement. Zionism is an expression of the desire of many Jews to live in their historical homeland. The largest numbers of immigrants have come to Israel from countries in the Middle East and Europe. The United States has played a special role in assisting Israel with the complex task of absorbing and assimilating masses of immigrants in short periods of time. Soon after Israel's establishment, President Truman offered $135 million in loans to help Israel cope with the arrival of thousands of refugees from the Holocaust. Within the first three years of Israel's establishment, the number of immigrants more than doubled the Jewish population of the country. Mass immigrations have continued throughout Israeli history. Since 1989, Israel absorbed approximately one million Jews from the former Soviet Union. The United States worked with Israel to bring Jews from Arab countries, Ethiopia and the former Soviet Union to Israel, and has assisted in their absorption into Israeli society. In addition, there has been immigration between the two countries, with many American Jews immigrating to Israel annually, while the United States is the top destination for Israelis emigrating abroad (yerida) permanently or for an extended stay. Several regional America–Israel Chambers of Commerce exist to facilitate expansion by Israeli and American companies into each other's markets. American companies such as Motorola, IBM, Microsoft and Intel chose Israel to establish major R&D centers. Israel has more companies listed on the NASDAQ than any country outside North America. The US and Israel are engaged in extensive strategic, political and military cooperation. This cooperation is broad and includes American aid, intelligence sharing, and joint military exercises. American military aid to Israel comes in different forms, including grants, special project allocations, and loans. President Obama pledged to maintain Israel's "QME" over the other countries in the region. To address threats to security in the Middle East, including joint military exercises and readiness activities, cooperation in defense trade and access to maintenance facilities. The signing of the Memorandum of Understanding marked the beginning of close security cooperation and coordination between the American and Israeli governments. Comprehensive cooperation between Israel and the United States on security issues became official in 1981 when Israel's Defense Minister Ariel Sharon and American Secretary of Defense Caspar Weinberger signed a Memorandum of Understanding that recognized "the common bonds of friendship between the United States and Israel and builds on the mutual security relationship that exists between the two nations". The memorandum called for several measures. One facet of the US–Israel strategic relationship is the joint development of the Arrow Anti-Ballistic Missile Program, designed to intercept and destroy ballistic missiles. This development is funded by both Israel and the United States. The Arrow has also provided the US with the research and experience necessary to develop additional weapons systems. So far, the development cost has been between $2.4 and $3.6 billion, with the United States picking up 50 percent of the final costs. In April 1996, President Bill Clinton and Prime Minister Shimon Peres signed the US–Israel Counter-terrorism Accord. The two countries agreed to further cooperation in information sharing, training, investigations, research and development and policymaking. At the federal, state and local levels there is close Israeli–American cooperation on homeland security. Israel was one of the first countries to cooperate with the U.S. Department of Homeland Security in developing initiatives to enhance homeland security. In this framework, there are many areas of partnership, including preparedness and protection of travel and trade. American and Israeli law enforcement officers and Homeland Security officials regularly meet in both countries to study counter-terrorism techniques and new ideas regarding intelligence gathering and threat prevention. In December 2005, the United States and Israel signed an agreement to begin a joint effort to detect the smuggling of nuclear and other radioactive material by installing special equipment in Haifa, Israel's busiest seaport. This effort is part of a nonproliferation program of the U.S. Department of Energy's National Nuclear Security Administration that works with foreign partners to detect, deter, and interdict illicit trafficking in nuclear and other radioactive materials. The United States maintains six war reserve stocks inside Israel, at Airwing 7 air base and maintains some $300 million in military equipment at these sites. The equipment is owned by the United States and is for use by American forces in the Middle East, but can also be transferred to Israeli use during a time of crisis. The United States is also alleged to keep fighter and bomber aircraft at these sites, and one of the bases is thought to contain a 500-bed hospital for US Marines and Special Forces. According to the American military journalist and commentator William Arkin in his book Code Names, the US has prepositioned in at least six sites in Israel, munitions, vehicles, and military equipment, and even a 500-bed hospital, for use by US Marines, Special Forces, and Air Force fighter and bomber aircraft in a wartime contingency in the Middle East. Arkin in his book writes that some of the sites are located at Ben Gurion Airport, Nevatim, Ovda air base, and in Herzliya Pituah. The sites are numbered as "site 51," "site 53," "site 54," "site 55" and "site 56." Some of the depots are underground, others were built as open hangars. According to Arkin, site 51 holds ammunition and equipment in underground depots. Site 53 is munitions storage and war reserve vehicles at Israeli Air Force bases, site 54 is an emergency military hospital near Tel Aviv with 500 beds, and sites 55 and 56 are ammunition depots. However, Israel is not the only country in the Middle East to host US military bases; there are American facilities in Turkey, Egypt, Jordan, Saudi Arabia (mostly withdrawn from in 2003), Oman, and the Persian Gulf states of Kuwait, Bahrain (headquarters of the United States Fifth Fleet), Qatar, and the United Arab Emirates. The Bahrain headquarters of the United States Fifth Fleet is meant to act as a watchdog and deterrent to potential Iranian aggression in the Persian Gulf region. The Israeli Mediterranean Port of Haifa hosts regular visits by navy vessels of the United States Sixth Fleet, which is headquartered in Naples, Italy. The Dimona Radar Facility is an American radar facility in the Negev desert of Israel, located near Dimona. The facility has two 400-foot radar towers designed to track ballistic missiles through space and provide ground-based missiles with the targeting data needed to intercept them. It can detect missiles up to 1,500 miles away. The facility is owned and operated by the US military, and provides only second-hand intelligence to Israel. The towers of the facility are the tallest radar towers in the world, and the tallest towers in Israel. The United States and Israel have cooperated on intelligence matters since the 1950s. Throughout the Cold War, Israel provided the US with information on Soviet-built weapons systems captured from the Arabs. Israel also provides the US with much of its Middle Eastern human intelligence. The CIA became more reliant on Israeli intelligence following the Iranian Revolution and the 1983 Beirut barracks bombing. Meanwhile, the US provided Israel with satellite imagery, and in the early 1980s, the CIA reportedly began giving Israel intelligence that it denied its closest NATO allies. In particular, Israel received almost unlimited access to intelligence from the KH-11 Kennan military satellite, though Israeli access was more restricted following Operation Opera. Despite intense intelligence cooperation, both countries have been heavily engaged in espionage operations against one another. The United States has mainly tried to penetrate Israel's political, military and intelligence circles and gather information on Israel's alleged nuclear and non-conventional capabilities, while Israel has also penetrated the US government, and has engaged in industrial espionage in the United States in an attempt to boost its military and alleged nuclear capabilities. In the most notable and publicized espionage case, Jonathan Pollard, a civilian analyst working for US naval intelligence, was arrested in 1985 and charged with conveying highly classified documents to Israeli agents. He pleaded guilty to one count of conspiracy to deliver national defense information to a foreign government, and was sentenced to life imprisonment. Israel later granted him citizenship, and has periodically requested his release. In 1996, two espionage scandals broke. It was revealed that the National Security Agency wiretapped the phone lines to Israel's embassy in Washington and broke the Israeli security code, exposing Israel's deepest policy secrets to the United States. The wiretapping was discovered following the widely publicized "Mega Scandal", when a phone call intercepted by the NSA became public. Due to Israel's expertise in computers and electronics and the sophistication of its electronic code system, it was widely believed that the NSA used an Israeli mole to obtain the security code. The resulting "Mega Scandal" was the allegation that Israeli intelligence had a highly placed mole within the US government. On 10 November 2004, a US submarine entered Israeli territorial waters eighteen kilometers off the coast of Haifa. The submarine's mission was never revealed. It was thought to have been trying to gather intelligence on the city's naval base and headquarters and other vital infrastructure, and was also suspected of intending to intercept Israeli naval electronic signals and test Israel's response to an intrusion. It also may have been trying to install sensors near Israeli naval headquarters and other vital installations. Minutes after it entered Israeli waters, the submarine was detected and tracked by the Israeli Navy. The submarine was initially identified as belonging to a NATO power, and later confirmed to be American. The Israeli General Staff refrained from ordering an attack on what was considered the asset of a friendly nation. After several hours, the submarine submerged and fled, presumably determining that it was under surveillance. The Israeli Navy then sent fast patrol craft, missile boats, and helicopters in pursuit. The submarine was not found, but military sources maintained that the submarine had failed to complete its mission. According to Israeli officials, such spy missions were common, and Western spy submarines had been intercepted by Israel before. The National Security Agency has confirmed that it provides to Israel raw unfiltered information intercepts that include private details and messages of American citizens. In December 2013, documents released by whistle-blower Edward Snowden revealed that in January 2009 the NSA and its British counterpart GCHQ had spied on an email address belonging to Israeli prime minister Ehud Olmert, and had monitored email traffic between then-Israeli Defense Minister Ehud Barak and his chief of staff, Yoni Koren. In May 2014, a National Security Agency document obtained by Snowden and published by journalist Glenn Greenwald revealed the CIA was concerned Israel had set up an extensive spying network in the United States. Defense secretaries from both countries denied the claim with Chuck Hagel saying he had no facts to substantiate the report, while Moshe Ya'alon said he was never allowed to spy on the United States while he was head of the Israeli intelligence services, "and as defense minister I don't allow spying on the United States whatsoever." Israel applied to join the US government's Visa Waiver Program in 2005. Under this program, citizens of selected countries can enter the United States for up to 90 days for tourism and business purposes without having to apply for an entry visa. The House of Representatives approved the bid, but the Senate rejected it. Israel failed to fulfill two basic requirements; not all citizens owning a biometric passport, and the entry visa rejection rate for Israelis exceeded 3%. In addition, the United States insisted that Palestinian Americans entering Israel not be subjected to any more security checks than other US citizens. In January 2013, a new bill was submitted to the House calling for Israel's inclusion, with its supporters saying Israel now meets the program's current criteria. As of 2014, Israel regularly bars the entry of American citizens. ^ a b "US Senator Rand Paul set to visit Israel". The Jerusalem Post - JPost.com. Archived from the original on 4 January 2013. ^ Sahar Okhovat. "The United Nations Security Council: Its Veto Power and Its Reform," (PDF). Sydney.edu.au. Retrieved 8 November 2015. ^ "RUSI - Middle East Peace: The Principles behind the Process". RUSI. Retrieved 8 November 2015. ^ Etzion, Eran. "Israeli-Russian Relations: Respect and Suspect | Middle East Institute". Mei.edu. Retrieved 17 September 2016. ^ Lincoln Mitchell (22 January 2015). "If U.S. Support Weakens, Will Israel Turn to Russia?". Observer. Retrieved 17 September 2016. ^ a b c "Top Secret American Military Installations In Israel". Jonathanpollard.org. 28 January 2004. Retrieved 8 November 2015. ^ Helms, Jesse (January 11, 1995). "Jesse Helms: Setting the Record Straight". Middle East Quarterly (Interview). 2 (1). Interviewed by Daniel Pipes; Patrick Clawson. Middle East Forum. Retrieved 2018-06-01. ^ Walworth (1986) 473–83, esp. p. 481; Melvin I. Urofsky, American Zionism from Herzl to the Holocaust, (1995) ch. 6; Frank W. Brecher, Reluctant Ally: United States Foreign Policy toward the Jews from Wilson to Roosevelt. (1991) chapters 1–4. ^ Michael Oren, Power, Faith and Fantasy, Decision at Biltmore, pp. 442–445: Convening in the art deco dining halls of New York's Biltmore Hotel in May 1942, Zionist representatives approved an eight-point plan that, for the first time, explicitly called for the creation of a "Jewish Commonwealth integrated in the structure of the new democratic world". Gone were the proposals for an amorphous Jewish national home in Palestine, for carving out Jewish cantons and delineating autonomous regions with an overarching Arab state. Similarly, effaced was the long-standing Zionist assumption that Palestine's fate would be decided in London. Instead, the delegates agreed that the United States constituted the new Zionist "battleground" and that Washington would have the paramount say in the struggle for Jewish sovereignty. Henceforth the Zionist movement would strive for unqualified Jewish independence in Palestine, for a state with recognized borders, republican institutions, and a sovereign Army, to be attained in cooperation with America. ^ "The Recognition of the State of Israel Online Research File". Truman Library. Retrieved 8 November 2015. ^ Lenczowski, American Presidents and the Middle East, p. 28, cite, Harry S. Truman, Memoirs 2, p. 158. The facts were that not only were there pressure movements around the United Nations unlike anything that had been seen there before, but that the White House, too, was subjected to a constant barrage. I do not think I ever had as much pressure and propaganda aimed at the White House as I had in this instance. The persistence of a few of the extreme Zionist leaders—actuated by a political motive and engaging in political threats—disturbed and annoyed me. ^ a b "The United States and the Recognition of Israel: A Chronology". Trumanlibrary.org. Retrieved 8 November 2015. ^ "Declaration of Establishment of State of Israel". GxMSDev. ^ "Eliahu Epstein to Harry S. Truman with attatchments re: recognition of Israel". trumanlibrary.org. ^ "U.S. Foreign Policy and Israel's Qualitative Military Edge:". www.washingtoninstitute.org. ^ "Israel's Qualitative Military Edge: Legislative Background". ^ "Ensuring Israel's Qualitative Military Edge". Archived from the original on 3 August 2018. Retrieved 1 September 2014. ^ William B. Quandt, Peace Process, American Diplomacy and the Arab-Israeli Conflict since 1967, p. 194 and ff. Begin himself explained Gahal's resignation from the government, saying "As far as we are concerned, what do the words 'withdrawal from territories administered since 1967 by Israel' mean other than Judea and Samaria. Not all the territories; but by all opinion, most of them." ^ Shibley Telhami, The Camp David Accords: A Case of International Bargaining, Columbia International Affairs Online. Log-in required. ^ P.R. Kumaraswamy (11 January 2013). Revisiting the Yom Kippur War. Routledge. pp. 105–. ISBN 978-1-136-32888-6. In February 1973, Kissinger held talks with Sadat's National Security Advisor, Hafez Ismail. ... memoirs that Kissinger told him that, on the basis of his conversations with Hafez Ismail, Egypt might be ready to start negotiating if Israel acknowledged Egyptian sovereignty over all of Sinai. Rabin consulted with Prime Minister Golda Meir and told Kissinger that Israel authorized him to explore this approach. ^ Farr, Warner D. "The Third Temple's Holy of Holies: Israel's Nuclear Weapons". Counterproliferation Paper No. 2, USAF Counterproliferation Center, Air War College, September 1999. ^ "New World Order". Al-bab.com. Archived from the original on 31 May 2011. Retrieved 27 May 2011. ^ 260 General Assembly Resolution 46-86- Revocation of Resolution 3379- December 16, 1991- and statement by President Herzog, Dec 16, 1991 Vol. 11–12: 1988–1992 and statement by President Herzog Archived 3 June 2011 at the Wayback Machine, Israel Ministry of Foreign Affairs web site. ^ Elliott Abrams, Tested by Zion: The Bush Administration and the Arab-Israeli Conflict (New York: Cambridge University Press, 2013)', pp. 105ff. ^ "US probes Israel cluster bomb use". Archived from the original on 29 August 2006. Retrieved 29 August 2006. ^ "Headlines for July 17, 2006". Democracy Now!. Archived from the original on 2 August 2006. ^ "Headlines for July 19, 2006". Democracy Now!. 19 July 2006. Archived from the original on 2 August 2006. ^ "Headlines for July 20, 2006". Democracy Now!. Archived from the original on 2 August 2006. ^ "Rome talks yield no plan to end Lebanon fighting". Reuters. 26 July 2006. Archived from the original on 10 July 2006. ^ Steele, Jonathan (25 September 2008). "Israel asked US for green light to bomb nuclear sites in Iran". The Guardian. Retrieved 21 June 2017. ^ "Israeli bunker-busters cause Mideast alarm" UPI, 28 September 2011. ^ a b "US-Israel row: Israeli views". BBC News. 24 March 2010. ^ "Clinton rebukes Israel over homes". BBC News. 12 March 2010. ^ a b "Reports: Netanyahu 'Humiliated' by Obama Snub". Fox News. 26 March 2010. ^ Glick, Caroline (19 March 2010). "Column One: Obama's war on Israel". Jerusalem Post. Retrieved 27 May 2011. ^ Whittell, Giles (26 March 2010). "Binyamin Netanyahu humiliated after Barack Obama dumped him for dinner". The Times. London. ^ Wong, Curtis (16 July 2010). "Netanyahu In 2001: 'America Is A Thing You Can Move Very Easily'". The Huffington Post. ^ "Israel Objects to Obama Remarks on Borders". Voanews.com. 19 May 2011. Retrieved 27 May 2011. ^ "Was Obama's speech too tough on Israel? Republican criticism mounts". Csmonitor.com. 19 May 2011. Retrieved 27 May 2011. ^ "Virginia Republicans twist Obama's statement on Israel's borders". politifact virginia. 31 May 2011. Retrieved 1 September 2012. ^ Helene Cooper (19 May 2011). "Turning Point For 2 Leaders Lacking Trust". The New York Times. p. A1. Retrieved 3 April 2012. ^ a b Kessler, Glenn (25 May 2011). "Michele Bachmann twists Obama's words on Israel". Washington Post. Retrieved 1 September 2012. ^ Haddadi, Anissa. "Is the Netanyahu Administration Responsible for Israel's Regional Isolation?" International Business Times, 4 October 2011. ^ Ravid, Barak. "U.S. to grant three-year extension of loan guarantees to Israel" Haaretz, 24 January 2012. ^ Chemi Shalev (28 February 2012). "U.S. policy aimed at 'buying time' with Iran, says senior official". Haaretz. Retrieved 6 March 2012. ^ "Israeli exports to U.S. top those to EU for first time since 2010". Haaretz.com. 7 October 2012. ^ William Booth (24 November 2013). "Israel's Netanyahu calls Iran deal 'historic mistake'". The Washington Post. Retrieved 14 January 2014. ^ Tova Dvorin (24 November 2013). "Bennett: Iran Deal Could Cause US Nuclear Attack". Israel National News. Retrieved 14 January 2014. ^ "Israel's security chiefs endorse new Iran agreement". United Press International. 26 November 2013. Retrieved 14 January 2014. ^ "New Labor leader Herzog criticizes Netanyahu and government over Iran deal". The Jerusalem Post. 25 November 2013. Retrieved 14 January 2014. ^ Gili Cohen (24 November 2013). "Former army intel chief: Iran deal better than alternative - no deal". Haaretz. Retrieved 14 January 2014. ^ Riechmann, Deb (2 April 2014). "Power: US Opposes Palestinian Moves to Statehood". ABC News. Washington: Associated Press. Archived from the original on 3 April 2014. Retrieved 2 April 2014. ^ Wilner, Michael (4 December 2014). "Congress enshrines Israel in a new class of ally". The Jerusalem Post. Retrieved 8 November 2015. ^ Horovitz, David (4 December 2014). "US Congress passes Israel strategic partnership bill". The Times of Israel. Retrieved 8 November 2015. ^ "US Congress passes Israel strategic partnership bill". Yahoo! News. AFP. 3 December 2014. Retrieved 8 November 2015. ^ "Poll: Israelis appreciate America, but Obama – not so much". Haaretz. Haaretz. 3 December 2014. Retrieved 4 December 2014. ^ "Israel Halts $6 million to UN to Protest UN Settlements Vote". Fox News. Associated Press. 6 January 2017. Retrieved 7 January 2017. ^ "House Overwhelmingly Votes to Condemn UN Resolution on Israel Settlements". Fox News. 5 January 2017. Retrieved 7 January 2017. ^ Cortellessa, Eric (6 January 2017). "US House Passes Motion Repudiating UN Resolution on Israel". The Times of Israel. Retrieved 17 January 2017. ^ "Report: Secret document affirms U.S.-Israel nuclear partnership". Haaretz. Haaretz. 7 July 2010. Retrieved 19 December 2014. ^ "Netanyahu Pledges Unrestricted Construction in East Jerusalem, Settlement Blocs". Haaretz. Haaretz. 22 January 2017. Retrieved 23 January 2017. ^ Wootliff, Raoul (18 September 2017). "US establishes first permanent military base in Israel". The Times of Israel. Retrieved 18 September 2017. ^ Landler, Mark (6 December 2017). "Trump Recognizes Jerusalem as Israel's Capital". Washington: The New York Times. Retrieved 6 December 2017. ^ "Editorial: On the 70th anniversary of the establishment of Israel, its people would do well to reflect on the peaceful spirit of the agreement". The Independent. London, England: Independent Print Ltd. 12 May 2018. Retrieved 15 May 2018. ^ U.S. Foreign Aid to Israel Archived 31 July 2015 at the Wayback Machine. Congressional Research Service report. April 11, 2013. By Jeremy M. Sharp. ^ Forbes (29 July 2007). "Israeli PM announces 30 billion US dollar US defence aid". Retrieved 3 August 2007. ^ The New York Times, 17 August 2007 "US and Israel sign Military deal". Retrieved 17 August 2007. ^ a b "Foreign Military Financing Account Summary". state.gov. ^ Pollak, Kenneth (2003). Unthinkable: Iran, the Bomb, and American Strategy. Simon and Schuster. p. 360. ISBN 1476733929. ^ "Lawrence Solomon: Israel can live without U.S. aid". Opinion.financialpost.com. Archived from the original on 14 September 2014. Retrieved 8 November 2015. ^ "Office of Management and Budget | The White House". Whitehouse.gov. Retrieved 27 May 2011. ^ "Obama Sold Israel Bunker-Buster Bombs". The Daily Beast. 23 September 2011. Retrieved 23 September 2011. ^ Ramirez, Luis. 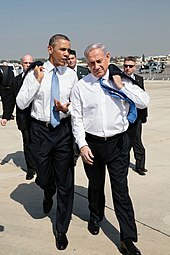 "Israeli Purchase of Fighter Jets Seen as Litmus Test for Continued US Support" voanews.com, 17 August 2010. Retrieved 18 August 2010. ^ "Israel's Offsets Soar; More Local Firms Earn a Share". Defense News. ^ Jeremy M. Sharp, U.S. Foreign Aid to Israel, Congressional Research Service (April 11, 2014). ^ "Israel Has Reached Childhood's End -- It's Time to End U.S. Aid to Israel". The Huffington Post. ^ David B. Green (2 January 2015). "Settlers Throw Stones at U.S. Consulate Convoy in West Bank". Haaretz.com. Retrieved 8 November 2015. ^ Dan Williams (2 January 2015). "American Diplomatic Convoy Stoned by Jewish Settlers on West Bank". Forward.com. Retrieved 8 November 2015. ^ Peter Beaumont. "Israeli settlers stone two cars belonging to US consulate staff". The Guardian. Retrieved 8 November 2015. ^ "Israeli settlers in stone-throwing confrontation with US diplomats". The Daily Telegraph. 2 January 2015. ^ Horovitz, David (2 January 2015). "US 'deeply concerned' by settler attack on consulate staff". The Times of Israel. Retrieved 8 November 2015. ^ "Israeli Settlers Threw Stones at U.S. Diplomats' Cars". Newsweek.com. Retrieved 8 November 2015. ^ "US embassy: Diplomats did not pull guns on settlers". Ynetnews.com. Retrieved 8 November 2015. ^ "Israel Police Say Settlers Attack US Officials in West Bank". The New York Times. 2 January 2015. Retrieved 8 November 2015. ^ "U.S. takes harder line on talks between Jerusalem, Damascus". Archived from the original on 6 March 2007. Retrieved 8 March 2007. ^ a b "Aaron David Miller - Israel's Lawyer". Washingtonpost.com. Retrieved 8 November 2015. ^ Urquhart, Conal (13 June 2005). "US acts over Israeli arms sales to China". The Guardian. London. ^ "U.S. Forced Israel to Freeze Venezuelan F-16 Contract: Ministry - 10/21/05 10:01". DefenseNews.com. Archived from the original on 24 July 2012. Retrieved 27 May 2011. ^ Dershowitz, Alan M.; Tovah Lazaroff (22 November 2009). "Background: Gilo is not a settlement, it's part of Jerusalem". The Jerusalem Post. Retrieved 27 May 2011. ^ "About the U.S. Consulate". Jerusalem.usconsulate.gov. Archived from the original on 7 July 2010. Retrieved 27 May 2011. ^ Newlin, Eliza. "Petraeus Throws His Weight Into Middle East Debate". Security.nationaljournal.com. Archived from the original on 14 July 2011. Retrieved 27 May 2011. ^ "From the Horse's Mouth: Petraeus on Israel « Commentary Magazine". Commentarymagazine.com. 25 March 2010. Retrieved 27 May 2011. ^ a b Bowen, Jeremy (9 May 2010). "Analysis: Bleak climate for Mid-East talks". BBC News. Retrieved 1 June 2010. ^ "Remarks by Vice President Mike Pence in Special Session of the Knesset". whitehouse.gov. Retrieved 26 March 2018. ^ Pompeo, Mike. "On the Merging of U.S. Embassy Jerusalem and U.S. Consulate General Jerusalem". U.S. Consulate General in Jerusalem. Archived from the original on 11 February 2019. Retrieved 21 October 2018. ^ Wilner, Michael (18 October 2018). "U.S. merges Jerusalem embassy and consulate". The Jerusalem Post. Retrieved 21 October 2018. ^ Palladino, Robert. "Merger of U.S. Embassy Jerusalem and U.S. Consulate General Jerusalem". U.S. Embassy in Israel. Archived from the original on 6 March 2019. Retrieved 4 March 2019. ^ "US closes Jerusalem consulate, demoting Palestinian mission". Times of Israel. Associated Press. 4 March 2019. Retrieved 4 March 2019. ^ Hansler, Jennifer (4 March 2019). "US Consulate in Jerusalem will merge with embassy". CNN. Retrieved 4 March 2019. ^ Keinon, Herb; Lazaroff, Tovah (4 March 2019). "US Consulate for Palestinians to be merged with Embassy Monday". Jerusalem Post'. Retrieved 4 March 2019. ^ "Country Ratings". Gallup.com. Gallup, Inc. Retrieved 22 August 2018. ^ "U.S. Image Suffers as Publics Around World Question Trump's Leadership". Pew Research Center's Global Attitudes Project. Pew Research Center. 26 June 2017. Retrieved 23 August 2018. ^ "Cbs News Poll: Fighting In The Middle East" (PDF). CBS News. Retrieved 27 May 2011. ^ "Thoughts on aid". Americans-world.org. 21 March 2002. Archived from the original on 24 May 2011. Retrieved 27 May 2011. ^ "New Poll Shows Strong and Stable U.S. Support for Israel in Third Week of Conflict with Iran-Backed Hezbollah". Newsblaze.com. 4 August 2006. Retrieved 27 May 2011. ^ "Israel, the Palestinians". Pollingreport.com. Retrieved 27 May 2011. ^ "Iraq, Iran, Afghanistan, N. Korea, China Viewed as World Hot Spots". Gallup, Inc. 21 February 2007. Retrieved 8 June 2011. ^ "Americans' Sympathies for Israel Match All-Time High". Gallup. 15 March 2013. ^ "Poll: American sympathy for Israel at record high". Jerusalem Post. 15 March 2013. Archived from the original on 17 March 2013. ^ "2013 World Service Poll (BBC)" (PDF). Globalscan.com. Retrieved 8 November 2015. ^ "Global Unease With Major World Powers | Pew Global Attitudes Project". Pewglobal.org. 27 June 2007. Retrieved 27 May 2011. ^ Naomi Zeveloff (22 February 2012). "Anti-Israel attitudes spreading at U.S. universities, report says". Haaretz. Retrieved 22 February 2012. ^ Chemi Shalev (14 February 2012). "The Israel Project: 'American Hispanics are the most hostile toward Israel'". Haaretz. Retrieved 2 March 2012. ^ Paul Berger (8 March 2012). "Pro-Israel campaign caught between backlash and success". Haaretz. Retrieved 9 March 2012. ^ Paul Berger (8 March 2012). "Campaign Succeeds in Stirring Charity Pot". Forward.com. Retrieved 8 November 2015. ^ Horovitz, David (16 December 2014). "Poll: Most Israelis believe US-Israel ties in crisis". The Times of Israel. Retrieved 8 November 2015. ^ "Poll finds Israelis appreciate US support, wary of Obama's policies". Times of Israel. 5 December 2014. ^ Talev, Margaret (15 April 2015). "Bloomberg Politics National Poll Finds Deep Partisan Split on Israel and Iran". bloomberg.com. Bloomberg Politics. Bloomberg L.P. Archived from the original on 16 April 2015. ^ "Welcome to". Israeltrade.org. Retrieved 27 May 2011. ^ "Israel: Second F-35 deal is in the cards." UPI, 8 June 2012. ^ John Pike. "Site 51, Israel". globalsecurity.org. ^ "Evolution of US-Israel Strategic Alliance". Jewish Virtual Library. Retrieved 8 November 2015. ^ "U.S.-Israel Intelligence Collaboration - Jewish Virtual Library". jewishvirtuallibrary.org. ^ John Pike. "Dimona - Introduction". globalsecurity.org. ^ "U.S. spies on Israel nukes, govt: official history". Reuters. 10 December 2008. ^ Melman, Yossi (27 April 2011). "U.S. spied on Israel's Washington embassy, claims ex-envoy". Haaretz. Retrieved 27 May 2011. ^ "WorldTribune.com: 'Advanced NATO' sub chased from Israeli waters". worldtribune.com. ^ "Report: Submarine spying off coast last year was American" AP, 5 June 2005. ^ "Report: Israel receives intelligence from US containing private information on US citizens". The Jerusalem Post - JPost.com. ^ "U.S., UK spies targeted Israeli PM, EU official: Snowden leaks". Reuters. 20 December 2013. ^ "Document reveals spying on US by Israel". Israel Herald. Retrieved 18 May 2014. ^ "US Congress to debate visa exemption for Israelis". Ynetnews.com. Retrieved 8 November 2015. ^ "US lawmakers eye visa exemption by 2015". Ynetnews.com. Retrieved 8 November 2015. ^ KLAPPER, BRADLEY; LEE, MATTHEW (25 April 2014). "Israeli Push for Visa-Free Travel to US Faces Test". abcnews.go.com. Associated Press. Retrieved 25 April 2014. Roth, Ariel Ilan. "Reassurance: A Strategic Basis of U.S. Support for Israel", International Studies Perspectives 10:4 (2009): 378-394. Bass, Warren. 2003. Support Any Friend: Kennedy's Middle East and the Making of the US-Israel Alliance. Oxford University Press. Wikimedia Commons has media related to Relations of Israel and the United States. Wikimedia Commons has media related to Barack Obama in Israel in 2013. How Special is the U.S.-Israel relationship?